It was in 2011 that I spent some time on the idea of using squares which were concatenations of other squares, and after a lot of work I abandoned it because I couldn’t see how it could result in a puzzle. The problem was that I had more than two squares joined together – it was all too complicated and messy. It was just before our neighbouring vicar’s rat incident that I reconsidered the idea. His mother was staying for a few days and heard something scuttling about in the roof shortly after she had settled for the night, and assumed it was a squirrel. The following day, the vicar’s wife saw a rat in the garden, screamed, and put two and two together having been told by her mother-in-law about the scrabbling above her bed. As the result of some Googling, the vicar dug a hole and put a half-filled bucket of water in it so that the top of the bucket was at ground level. Resting on the top was some peanut-butter-coated sweetcorn on a freely-rotating spindle. During the following night, the rat pounced on his snack, fell off it, and drowned – not the sort of thing that I’d do (or surely a man of God, you might think), but problem solved. “What has that got to do with this puzzle?” you may ask. Erm… well, they both involve the solving of a problem, and erm… sometimes a solver says, “Rats!” when they are frustrated. 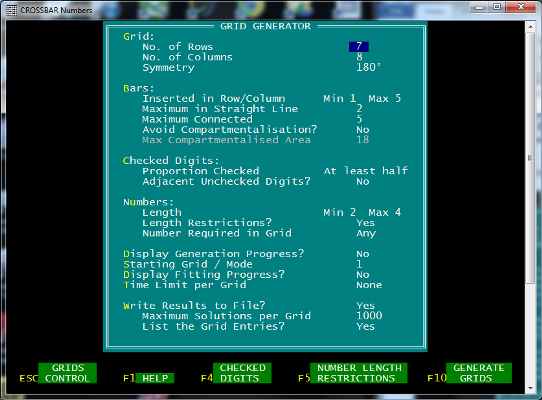 Many years ago I wrote a DOS-based program which created all (blocked) grids according to entered criteria and which filled each generated grid with words (or numbers) from a specified set, and after I retired I developed a bars version. These programs would now be considered antique. The number-length restrictions (entered on a separate screen) limited the number of 2-digit numbers to ten, and 4-digit ones to six. I created a set of 40 pairs of numbers which could be used in the puzzle, and tweaked the program so that only filled grids with exactly one unmatched number were written to the output text file. It transpired that a 7 × 9 grid was too large for a filled grid to be possible, and since at least one of the numbers of rows and columns had to be odd (for there to be an odd number of grid entries), I had to settle on a 7 × 8 grid (which I thought was rather on the small side). On the first attempt there were a number of possible grids and so I tightened up the criteria in various ways and did some other runs. In one run with a 7 × 8 grid, over 8.8 million grids were generated resulting in over 154 million filled ones, but none of them had just one single unmatched number. In a subsequent run, over 6.8 million grids were generated with 80 million filled grids. Only eight of these had a single unmatched number but I was surprised that there were any at all. Shirley: the run took just over a day using just a single core; there was only a little steam coming from the PC. The eight grids contained trivial variations of the same basic grid, and so I chose a grid from a previous run which could be filled in only one way but which used slightly inferior criteria (the arrangement of the bars in the grid wasn’t quite as elegant). In this run it was the 319,051st grid generated which was used after having filled the grids in 18,650,895 different ways. I needed the clues to help the solver discover the theme, and so I decided to use letters which represented squares or two abutting squares. When the letters were ordered (by ascending value) they could provide a further hint or hints. For elegance, I didn’t want any subtraction or division in the clues, and anyway that type of clue is not generally very helpful. I also decided to avoid any digits in the clues, partly for elegance and partly as a challenge. I developed a program which produced thousands of possible clues and pored through these until I found one or two that could form a starting point. Subsequent clues were chosen which used the deductions so far, thus producing a solving path. Using SQUARE as part of the hint used too many useful letters for further hints to be possible, and so I hit upon BY ITSELF. The only word I could find from the remaining letters which implied ‘divide’ or ‘split’ was GAP. When looking at the then remaining letters I noticed that RDX (which could suggest radix) was available and JNUMZ could suggest joined numbers, but that was just a nice touch rather than being intended as a hint. For the setters and solvers who feel that using a computer to set a puzzle is cheating, may I say that without that facility the puzzle would, quite simply, not exist (which undoubtedly would delight some solvers!). This entry was posted on 14 June 2015 at 11:00 pm	and is filed under Setting Blogs. You can follow any responses to this entry through the RSS 2.0 feed. You can leave a response, or trackback from your own site. I don’t think I’ve said that your method of composing puzzles was cheating. It is unnecessary in my case in that although we are both crucinumerists our styles are different. I just feel that the computer generated grid and clues to be rather impersonal that’s all and that’s just me! I find the use of subtractions and divisions in clues to be quite useful. Thanks for the blog which made interesting reading. Perhaps your vicar should get a cat as that would keep the vermin at bay – ours do!